The posterior tibial tendon starts at the inside of the leg and runs down the inside of the ankle and attaches in the middle of the arch. The main attachment point is at a bone called the navicular, but the tendon fans out to attach to other bones in the bottom of the foot. The posterior tibial tendon is one of the main structures which maintains and supports the arch. When the posterior tibial tendon is not functioning properly, the arch is not maintained and will collapse. When there is too much force, tension or stress on the posterior tibial tendon, the tendon becomes overworked. The result is microtears, inflammation and the development of tendonitis. The two most common locations of pain are at the insertion of the tendon on the navicular and inside the ankle. Just as with Achilles tendonitis, the first 2-4 weeks are inflammatory and after this period of time, the tendon will gradually start to degenerate and progress towards tendonosis. 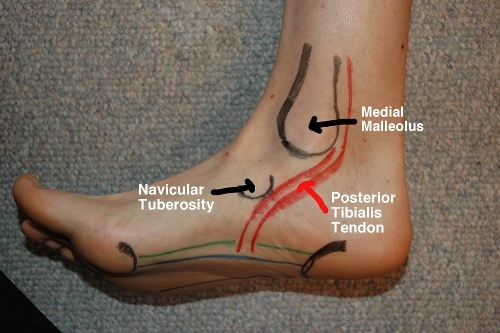 Posterior tibial tendonitis is generally associated with flatfeet. But, the cause is not simply an arch collapse. The development of posterior tibial tendonitis and the associated flatfoot (adult aquired flatfoot) is due to abnormal foot biomechanics. Most individuals with posterior tibial tendonitis have an abnormal amount of pronation. In the image to the right, the foot is pronating. The foot is flexing up at the ankle, the forefoot is turning out away from the midline of the body and the heel is rotating out, away from the midline of the body. This is pronation when the foot is not bearing weight. It’s important to note the rotation of the heel (eversion). The posterior tibial tendon controls eversion and the amount of pronation while walking. Once the heel rotates in, the midfoot starts to collapse and excess stress is placed on the posterior tibial tendon at the ankle area and at the insertion. Chronic overuse of the posterior tibial tendon leads to tendonitis. For individuals with abnormal pronation, the tendon is constantly under abnormal stress and something as simple as a shoe change or a weekend warrior event can stimulate the development of tendonitis. In some individuals, it is only a matter of time before the tendon will become irritated, inflamed and painful. Treatments for posterior tibial tendonitis The treatments are essentially the same for posterior tibial tendonitis as they are for Achilles tendonitis. Tendinosis is the degeneration (deterioration) of the tendon. The collagen fibers which make up the tendon become disorganized and infiltrated with small blood vessels, which results in a weakened tendon. Tendinosis is not an inflammatory condition, it is a degenerative condition. Peroneal tendonitis is another common tendonitis in the foot. The peroneal tendons are located on the outside of the ankle and insert on the midfoot. These tendons function to balance and stabilize the foot while walking. The most common type of pain is a dull pain on the outside of the foot. Many will notice what they think is a lump. It is actually the bone which one of the peroneal tendons attaches called the styloid process, located at the base of the 5th metatarsal. The peroneus brevis tendon is the more common of the two tendons to develop tendonitis. The pain generally occurs with walking and standing, but there can also be stiffness at the first step in the morning, similar to Achilles tendonitis. It is not as common to develop peroneus longus tendonitis. The pain is similar in quality, but is in a different location. Although it can also be at the outside of the ankle, the pain may extend under the arch. The treatment for peroneal tendonitis is very similar to the treatment for Achilles tendonitis. Follow the regimen listed above. Identifying the cause of the tendonitis is important and it’s essential to eliminate aggravating activities like walking on uneven terrain or walking in worn out shoes.